Lately Daniel and I have been talking about buying a house. Next spring when the lease on our apartment ends, we’re planning to pack up and head back home to Massachusetts. Just thinking about being closer to our family and friends makes me happy. When I look around our little apartment now, I wonder what it would be like to have storage, or counters that didn’t stain upon contact with just about anything that isn’t water, or enough space for one of those beautiful farmhouse tables I love, or a wide enough bedroom for a nightstand on my side of the bed, or oh my gosh—a dishwasher. And eeeven though I’m pretty elated about that dishwasher (remember when I wrote a cookbook in a thimble, also known as an NYC apartment kitchen? ), it’s not my favorite home daydream. The thing I think about most often is, How soon can I start hosting holidays? 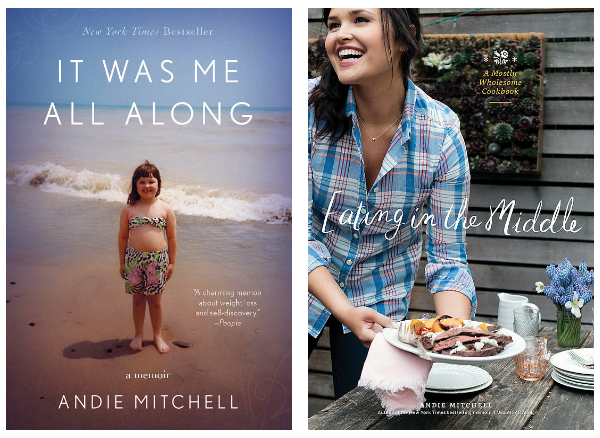 Parties, brunches, book clubs…anything. Everything. Our house will be a warm, open, loud…function facility. Probably run by my mother. And I can’t wait. I just haven’t told Daniel that yet. These crispy-crunchy-creamy little toasts are some of most delicious appetizers I can imagine serving friends and family. 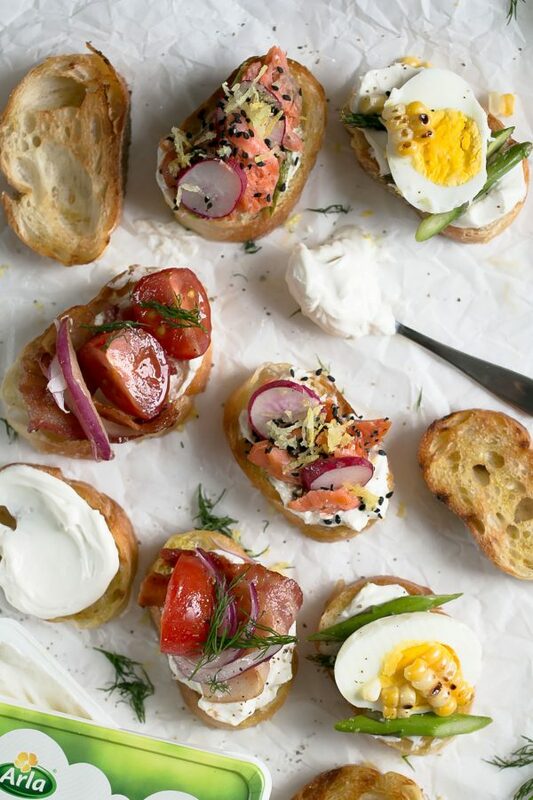 I love that crostini are so versatile. I’ve never had a combo I didn’t like and it’s not all that hard to make them taste great with only a few ingredients. 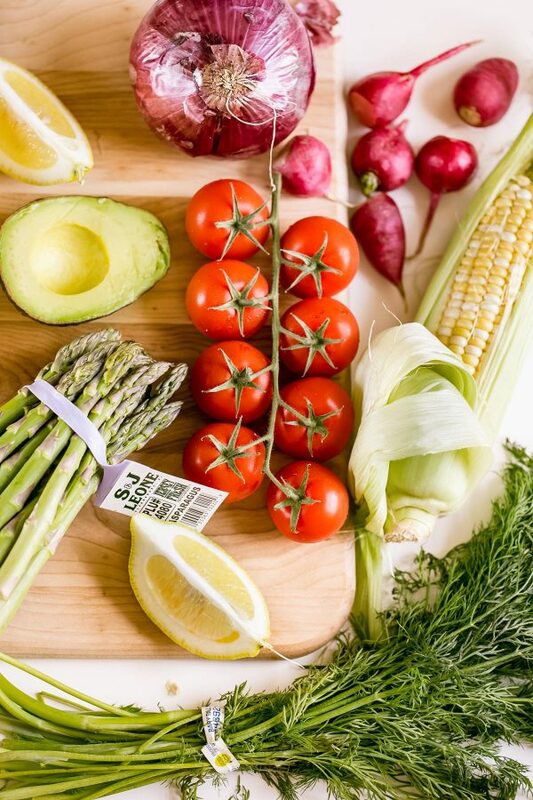 Making summery crostini was a no-brainer, since we have so many fresh veggies available to us in June, like fresh corn, sweet tomatoes, radishes, and asparagus. But I can see swapping in fall vegetables come October or November and loving them just as much. 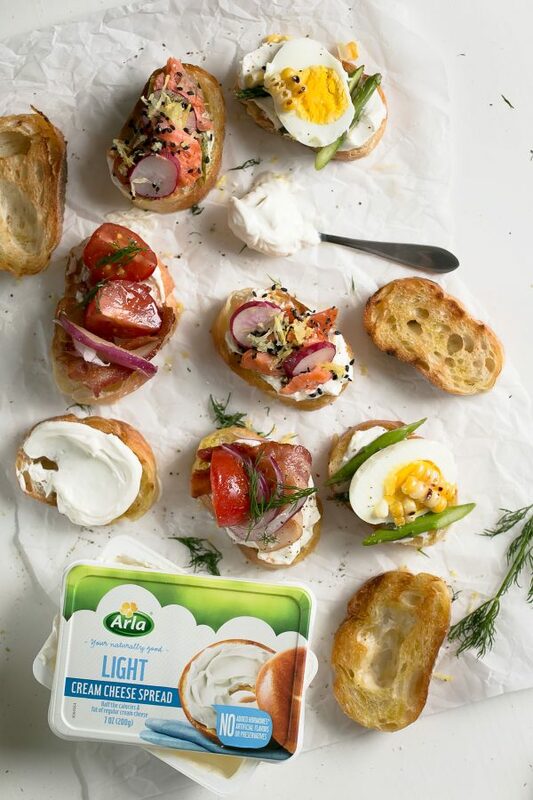 To add some richness and bring all of the fresh flavors together, I used one of my fridge staples: Arla light cream cheese. This cool, creamy spread is so smooth and versatile, and hands-down the most fresh-tasting cream cheese on the market. The ingredients are pure and uncomplicated. It’s not overtly tangy or even the slightest bit gelatinous, like other brands’ light versions I’ve had. It’s mild, smooth, and perfectly silky. Salty bacon was made for something sweet, like a ripe tomato and tart, sweet balsamic. Add to that some fragrant dill and smooth cream cheese and you’re on another level. Sweet charred corn, asparagus, and bright citrus zest are true summertime flavors, so pairing them with velvety cream cheese and an egg makes the perfect seasonal appetizer. It’s a cross between a bagel and lox and a salmon avocado roll and that’s why it’s so lovely. The sesame seeds and radish add the right crunch! Grill the baguette: Light your grill. Lightly brush both sides of your baguette pieces with olive oil and grill over high heat until toasted and lightly charred in spots, 1 minute per side. Make the Balsamic Tomato Crostini: On a cutting board, use the back of a spoon to smash the garlic into a paste, then add it to a medium bowl. Whisk in the balsamic and oil, salt and pepper. Add the tomatoes and onion and toss. Let sit at room temperature for at least 15 minutes and no more than 30 minutes. 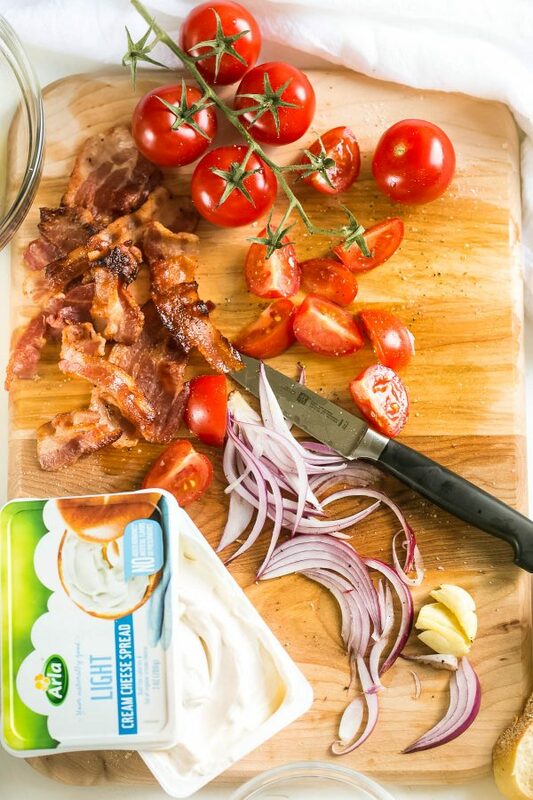 Assemble the crostini: Spread cream cheese on the baguette, followed by bacon, a small spoonful of the drained balsamic tomatoes and onion, and top with a sprig or 2 of dill. Finish with freshly ground black pepper. Bring eggs and cool water to a boil over high heat. Once boiling, cover the pot and remove it from heat. Let stand 12 minutes. Drain and submerge the eggs in ice cold water. When they’re cool enough to handle, peel them and slice them with a sharp knife. For the corn and asparagus: toss both veggies in oil and season with salt and pepper. 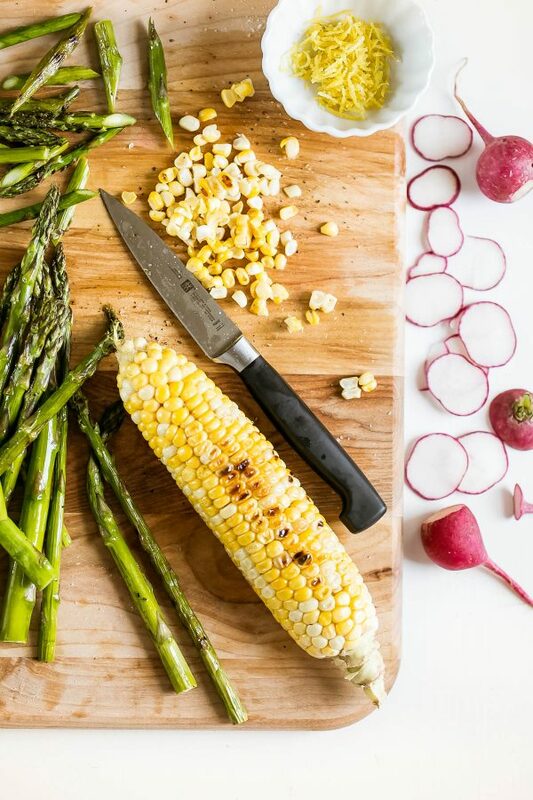 Light a grill or grill pan and grill them, turning frequently, until the asparagus spears are tender and well browned, about 12 minutes, and the corn is a deep golden yellow and blackened in spots, 15 to 20 minutes. Cut the kernels from the cob. Cut the asparagus into 1-inch pieces. Assemble the crostini: Spread with cream cheese, followed by asparagus, sliced egg, corn kernels, and a sprinkle of lemon zest. Make the sesame salmon avocado crostini: Spread cream cheese on the baguette, followed by a slice or 2 of avocado, smoked salmon, sliced radish, and a sprinkling of sesame seeds. Add lemon zest, if desired. Is it possible for you all to buy a bed and breakfast but just not rent it out all the time? It seems appropriate and sanity saving to me?! I think you and I could start a lot of trouble with our definitions of what is possible/appropriate though:) best wishes on the house hunt!!!! Big covered porch would be like right up there on the priority list for me mostly because we have approximately zero porch or places to put one now. I’m drooling over these pics, I can’t wait to get creative, such an inspiring recipe. Complimenti, davvero un blog di livello internazionale!